A strong economy can enable a redistribution of its larger resources in order to reduce poverty, Finance Minister Arun Jaitley said at the Business Standard Awards on Friday. Honouring the best and the brightest of India Inc and social sectors, Jaitley said in this day and age civil society’s ability to understand what was in its interests was greater than what politicians and the media prescribed. 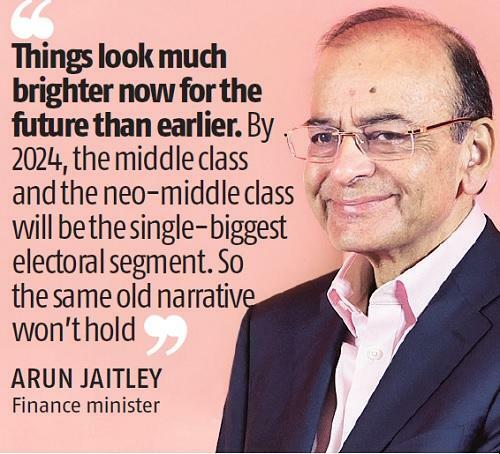 With less than two weeks to go for the Lok Sabha elections, the finance minister said the “mind space now is elsewhere and not really on the economy”. With election, the idiom changes, he said. Without directly referring to the recent announcement by the Congress on its minimum income guarantee proposal NYAY, Jaitley spoke about other ways of poverty elimination. The slogans of the past have lost their relevance, he pointed out, adding that it’s time to move forward for an informed debate. “Things look much brighter now for the future than earlier. India has a great future. By 2024, the middle class and the neo-middle class will be the single-biggest electoral segment. So the same old narrative will not hold,” he said. “If you go back to the Hindu growth rate, you can only redistribute poverty but you did not have resources to get rid of it. Therefore, this Indian model, which is developing now, of market-based economy with social consciousness, is more competitive, produces the best talent. Then you have a globally competitive system. All these enable you to improve the quality of life,” Jaitley said. 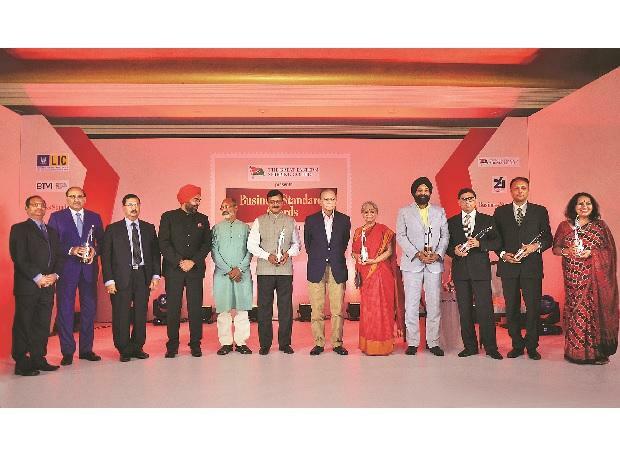 Among the major awards, Jaitley presented the Lifetime Achievement Award to Godrej Group Chairman Adi Godrej, the Chief Executive of the Year Award to Vinod K Dasari of Ashok Leyland, and the Company of the Year Award to Hindustan Unilever. While underscoring the need for lowering of public discourse as political rivals try to score points at the hustings, Jaitley said, “I do believe one of the areas required to be corrected is the subversion of public discourse based on absolutely bizarre thesis.” Jaitley said half in jest that he was waiting for the “next seven weeks to get over” for the sanity of discourse to return after the elections. Jaitley reiterated a number of achievements of the Modi government, such as the goods and services tax (GST), Insolvency and Bankruptcy Code (IBC), Ayushman Bharat and increase in the tax base despite reduction in tax rates. “We have taken a thousand decisions in 34 GST Council meetings, and each one has been through a consensus. We had a majority, but we never resorted to voting. The biggest critics of the GST would not be able to speak for even five minutes, if asked, and it will all be sloganeering,” he said. Also, the IBC has brought about an ethical discipline in businesses, according to the finance minister. That is, if a company does not or cannot pay, it should be ready to exit. He pointed out that two-thirds of the amount had been recovered without resolution or winding up the companies concerned. “Without adjudication, there have been changes in business ethics. Earlier, companies ran after bankers, and then bankers ran after companies. Now the situation has been reversed,” he said. On the government’s flagship health scheme Ayushman Bharat, he said in the first seven-eight months it had served 180,000 people and would touch the 10-million mark in the next two years. “The scheme costs just 0.1 per cent of the nation’s gross domestic product, but touches 40 per cent of its population,” he said. On Aadhaar, Jaitley said the unique identification programme would make a very big difference to poverty elimination in the country. “When Nandan Nilekani devised the idea of the UIDAI (Unique Identification Authority of India), there was resistance from some departments in the government. We had our own version of those 108 economists to warn us that national security would be compromised. When we came to power, we had a meeting with Nilekani, who convinced us of Aadhaar and its potential, and suddenly my friends in the Congress said they won’t allow the Bill to be passed in the Rajya Sabha,” he said. Jaitley said he was happy that the Congress would use the direct benefit transfer (DBT) system to implement their new poll promise. He was indirectly referring to the Congress’ NYAY proposal to transfer Rs 6,000 per month directly to the bank accounts of 20 per cent poorest people in the country. Returning to the theme of elections and public discourse, he said there used to be a document in the Budget titled “taxes foregone”, around which much of the misconception arose that privileges were given to the rich. “The reality in fact was that these contained rebates to the middle class for savings for taxes and difference between the bound rate and the applied rate in direct taxes. When I analysed it, I changed the title of the booklet to “tax incentives” for boosting the economy and encouraging savings. The misconceptions went away,” he said.